A Colles Fracture is a complete fracture of the radius bone of the forearm close to the wrist resulting in an upward (posterior) displacement of the radius and obvious deformity. It is commonly called a “broken wrist” in spite of the fact that the distal radius is the location of the fracture, not the carpal bones of the wrist. The fracture originates from a fall on the outstretched hand and is usually associated with dorsal and radial displacement of the distal fragment, and disturbance of the radial-ulnar articulation. Possibly the ulnar styliod may be fractured. Communication of the distal fragment and fractures into the joint surface are present in some of these fractures. The colles fracture is one of the most common and challenging of the outpatient fractures. Colles' fracture is defined as a linear transverse fracture of the distal radius approximately 20-35 mm proximal to the articular surface with dorsal angulation of the distal fragment. A normal posteroanterior (PA) radiograph of the radius is shown in the image below. The ulna is generally within 2 mm of the radius. The distal radius forms the proximal side of the wrist joint. There, the radius articulates with the proximal row of carpal bones (allowing flexion and extension); it also articulates with the distal ulna (creating a joint for pronation and supination). The distal ulna attaches to a meniscus-like structure, the triangular fibrocartilage discus, which can be torn with wrist fractures. On the lateral side of the radius is a styloid process, onto which the brachioradialis inserts and from which the radial collateral ligament of the wrist originates. At the distal metaphysis of the radius, the cortex of the bone is thinner than the bone proximal and distal, and the relative amount of cancellous bone increases. The distal metaphysis of the radius is therefore a relative weak point. This make fractures more likely, especially in patients with decreased bone mineral density. Low energy extra-articular fracture of the distal radius. Can be associated with ulnar styloid fracture, TFCC tear, scapholunate dissociation. Females are predilected more than males for this type of injury and oftentimes there is a precedent history of osteoporosis.' In the United States and in Northern Europe, colles fractures are the most common fractures in women up to the age of 75 years. It is known that these fractures appear mostly by young adults and the elderly. Stable Colles' fractures present with minimal comminution. Unstable fractures are distinctly comminuted often with corresponding avulsions of the radial or ulnar styloid, that have the potential to cause compression neuropathies, especially of the median nerve. Other complications that have been reported are degenerative joint disease and reflex sympathetic dystrophy. Younger patients have stronger bone, and thus, more energy is required to create a fracture in these individuals. Motorcycle accidents, falls from a height, and similar situations are common causes of a DRF. Trauma is the leading cause of death in the 15- to 24-year-old age group, and this is also reflected in the incidence of lesser traumas. Older patients have much weaker bones and can sustain a DRF from simply falling on an outstretched hand in a ground-level fall. An increasing awareness of osteoporosis has led to these injuries being termed fragility fractures, with the implication that a workup for osteoporosis should be a standard part of treatment. As the population lives longer, the frequency of this type of fracture will increase. The clinical presentation of Colles fracture is commonly described as a dinner fork deformity. A distal fracture of the radius causes posterior displacement of the distal fragment, causing the forearm to be angled posteriorly just proximal to the wrist. With the hand displaying its normal forward arch, the patient’s forearm and hand resemble the curvature of a dinner fork. Signs and Symptoms- Pain, numbness, tenderness, bruising, deformity of wrist. Gosta Frykman identified many different forms of Colles fracture and classified it into eight different types based on the extra- or intra-articular nature of fractures involving the distal ends of the radius and ulna. Few very rare complications are carpal tunnel syndrome, Sudeck's atrophy and ulnar and radial compression neuropathy. 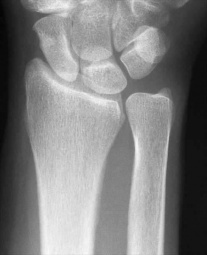 X-ray of a collesfracture of the left wrist accompanied by an ulnar styloid fracture. A careful history including the mechanism of injury establishes suspicion for a Colles fracture. Diagnosis is most often made upon interpretation of pasteroanterior and lateral views alone. Associated fracture of the ulnar styloid process in more than 60% of cases. The treatment of Colles fractures will depend on the type of Colles fracture present, the age and activity level of the patient, the surgeon’s preference, and the patient’ s desires regarding immobilization and return to activity. As Colles fractures are so common, many methods of treatment have been developed to stabilize the fractures and allow the bone to heal. The ultimate goal is to return the wrist to its prior level of functioning. Management of a Colle's fracture depends on the severity of the fracture. An undisplaced fracture may be treated conservatively with a cast alone. The cast is applied with the distal fragment in palmar flexion and ulnar deviation. Surgical options can include: external fixation, internal fixation, percutaneous pinning, and bone substitutes. A fracture with mild angulation and displacement may require closed reduction. Significant angulation and deformity may require an open reduction and internal fixation or external fixation. The volar forearm splint is best for temporary immobilization of forearm, wrist and hand fractures, including Colles fracture. A higher amount of instability criteria increases the likelihood of operative treatment. Many patients will present to a physiotherapist with pain, edema, decreased range of motion, decreased strength, and decreased functional abilities. Once a Colles’ fracture has healed rehabilitation is recommended in an attempt to restore function and strength to the fractured wrist. The primary focus in early rehabilitation is to mobilize the wrist, which is indicated approximately 7-8 weeks post fracture. If the fracture has been managed using an internal fixation device, early mobilization can begin as early as 1 week post surgery. Caution should be paid to fractures that have been treated with external fixation as the wrist is often held in a pronated position. This can predispose the patient to a contracture at the distal radioulnar joint. Other soft tissue injuries that may affect rehabilitation progress include; edema, cast impingement, infection, osteomyelitis, adherent scar, intrinsic or extrinsic muscle tightness, joint capsular tightness, neurovascular injury, ligament injury, and post-traumatic arthritis. One of the primary goals in early rehab is to restore normal range of motion (ROM) at the wrist with both passive ROM and progression to active ROM. Wrist flexion and extension are often the first motions emphasized working within the patients pain free avaialble range. Wrist flexion and extension are often the first motions emphasised working within the patients pain free available range. The addition of ROM exercises helps to limit scar tissue and adhesion formation that commonly occur after surgery. It is also important to emphasise motion at the joint above and below (shoulder, elbow, and fingers) during all phases of rehab. One of the primary focuses in early rehab is to limit pain and the amount of oedema present in the wrist and hand region. The next phase of rehab in the treatment of Colles’ fracture continues to focus on increasing wrist ROM and the commencement of strengthening exercises. For fractures that were surgically treated, ROM should be regained between 6 to 8 weeks post-op. Examples of ROM exercises that can performed include: wrist flexion/extension, radial/ulnar deviation, pronation/supination, and making a fist and opening. In the sub-acute phase, ROM exercises can progress into strengthening by performing all exercises with a weight in the hand or performing grip squeeze with a foam ball or a towel roll. During strengthening, it is important to address all forearm muscles but also the extrinsic and intrinsic hand muscles progressively building resistance as the individual gets stronger. During this phase, progressive stretching can begin to increase available ROM. Each stretch should be held for 30-60 seconds for 3 repetitions. If the patient is unable to tolerate a slow, prolonged stretch, shorter stretches of 10 seconds can be performed for 10 repetitions. Cryotherapy is an effective modality for controlling edema in the acute phase after trauma and during rehab due its ability in helping to decrease blood flow through vasoconstriction limiting the amount of fluid escaping from capillaries to the interstitial fluid. Cryotherapy can also be combined with compression and elevation in the treatment of oedema. To control pain using cryotherapy, the modality should be applied to the area for 10-15 minutes which can result in pain control up to 2 hours post application. Precautions for the use of cryotherapy include: over a superficial branch of nerve, over an open wound, poor sensation or mentation, and very young or very old patients. Contraindications for cryotherapy include; Acute febrile illness, Vasospasm e.g. Raynaud’s disease, Cryoglobinaemia, Cold urticaria. The use of transcutaneous electrical nerve stimulation (TENS) may be used as an adjunct during any phase of rehab to address pain but can be particularly useful for patients that are increasing the level of activity of the wrist. Conventional (high-rate) TENS is useful for disrupting the pain cycle through a prolonged treatment session as great as 24 hours a day. Low-rate TENS is another form of electrical stimulation that is successful in diminishing pain by targeting motor or nociceptive A-delta nerves. Low-rate TENS has been reported to be effective in pain control for up to 4-5 hours post-treatment. The literature is still not conclusive on this topic and the results of one study may contradict or, on the contrary, reinforce the results of another study.Yet there is evidence supporting the beneficial effects of electrical stimulation, especially in combination with physiotherapy exercises. A case report used a rehabilitation protocol to improve range of motion and grip strength in an undisplaced, stable Colles' fracture. The patient got a treatment with passive interventions to improve circulation and prevent immobilization adhesion formation. These treatments included application of an ice pack to reduce edema followed by application of a wax bath on the affected wrist. Gentle range of motion mobilizations were then introduced that could only be performed in flexion and extension to the patient's pain tolerance. Three sets of 5 flexion/extension repetitions were performed on the affected wrist. The joint was also mobilized in circumduction, ulnar flexion and radial flexion to the patient's level of tolerance. Early mobilisation resulted in rapid recovery of both movement and strength without causing more discomfort or adversely influencing the progression of the deformity. In patients over 55, minimally displaced fractures can safely be treated in a crepe bandage, and displaced fractures which have been reduced can be treated in a modified cast. Early mobilisation would ensure rapid recovery of wrist and hand function while avoiding the complications of a conventional plaster cast. This study  proved that in the groups with displaced and undisplaced fractures, the recovery of forearm rotation and finger movement paralleled the recovery of wrist movement: for both types of fracture, early mobilisation led to an earlier return of strength. Although this recovery did not parallel the improvement in wrist movement. In both categories early mobilization led to more rapid resolution of wrist swelling in the first five weeks. At nine weeks and at 13 weeks the wrist girths were similar. Patients encouraged to mobilise the injured wrist from the outset recovered wrist movement more quickly than those who were immobilized in a conventional plaster cast. ↑ 6.0 6.1 MacDermid JC, Roth JH, Richards RS. Pain and disability reported in the year following a distal radius fracture: a cohort study. BMC Musculoskeletal Disord. 2003;4:24. 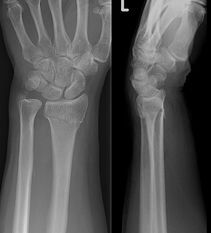 ↑ Owen RA, Melton LJ, 3rd, Johnson KA, Ilstrup DM, Riggs BL., Incidence of Colles’ fracture in a North American community. Am J Public Health. 1982;72(6):605–607. ↑ Cummings SR, Kelsey JL, Nevitt MC, O’Dowd KJ., Epidemiology of osteoporosis and osteoporotic fractures. Epidemiol Rev. 1985;7:178–208. ↑ 9.0 9.1 Munk PL, Munk P, Ryan A. Teaching Atlas of Musculoskeletal Imaging. Thieme Medical Pub. (2007) ISBN:1588903729. ↑ Hoynak BC, Hopson L. EMedicine. 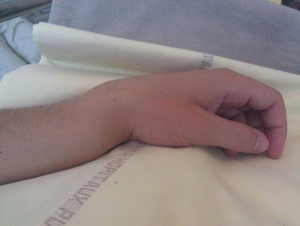 Wrist Fractures.http://emedicine.medscape.com/article/828746-overview (Acessed 2 July 2009). ↑ Joseph TN. Medline Plus. Colles' Wrist Fracture.http://www.nlm.nih.gov/medlineplus/ency/article/000002.htm (Accessed 2 July 2009). ↑ Bohndorf K, Imhof H, Pope TL. Musculoskeletal Imaging, A Concise Multimodality Approach. George Thieme Verlag. (2001) ISBN:1588900606. ↑ Reiser M, Baur-Melnyk A. Musculoskeletal Imaging. TIS. (2008) ISBN:3131493410. ↑ Adam,, Greenspan,. Orthopedic imaging : a practical approach. Beltran, Javier (Professor of radiology), (Sixth edition ed.). Philadelphia. ↑ Arora R, Gabl M, Gschwentner M, Deml C, Krappinger D, Lutz M. A comparative study of clinical and radiologic outcomes of unstable colles type distal radius fractures in patients older than 70 years: nonoperative treatment versus volar locking plating. J Orthop Trauma. 2009;23(4):237-242. ↑ Wright TW, Horodyski M, Smith DW. Functional outcome of unstable distal radius fractures: ORIF with a volar fixed-angle tine plate versus external fixation. J Hand Surg Am. 2005;30(2):289-299. ↑ Tremayne A, Taylor N, McBurney H, Baskus K. Correlation of impairment and activity limitation after wrist fracture. Physiother Res Int. 2002;7(2):90-99. ↑ 26.0 26.1 26.2 Bosch J, Walsh M. Standard of care: Distal upper extremity fractures. The Brigham and Women's Hospital Web site. http://www.brighamandwomens.org/Patients_Visitors/pcs/rehabilitationservices/Physical%20Therapy%20Standards%20of%20Care%20and%20Protocols/Upper%20Extremity%20-%20Distal%20Fracture%20OT%20SOC.pdf. ↑ Slutsky DJ, Herman M. Rehabilitation of distal radius fractures: a biomechanical guide. Hand Clin. 2005;21(3):455-468. ↑ 30.0 30.1 Rischak GD, Krasteva A, Schneider F, Gulkin D, Gebhard F, Kramer M. Physiotherapy after volar plating of wrist fractures is effective using a home exercise program. Arch Phys Med Rehabil. 2009;90(4):537-544. ↑ Kisner CC, LA. Therapeutic exercise. foundations and techniques. 5th ed. Philadelphia: F.A. Davis Company; 2007:928. ↑ 32.0 32.1 32.2 32.3 Pho C, Godges J. Colles' fracture. KPSoCal Ortho PT Residency Web site. http://xnet.kp.org/socal_rehabspecialists/ptr_library/04WristandHand%20Region/20Wrist-CollesFracture.pdf. ↑ 33.0 33.1 Swenson C, Swärd L, Karlsson J. Cryotherapy in sports medicine. Scandinavian journal of medicine & science in sports. 1996 Aug 1;6(4):193-200. ↑ 34.0 34.1 34.2 34.3 Cameron M. Physical agents in rehabilitation. from research to practice. 3rd ed. Philadelphia: Saunders Elsevier; 2009:457. ↑ Swenson C, Swärd L, Karlsson J. Cryotherapy in sports medicine. Scandinavian journal of medicine & science in sports. 1996 Aug 1;6(4):193-200.